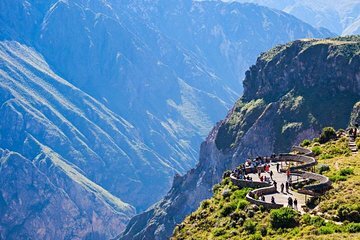 Noen av Perugas mest spektakulære natur er funnet rundt Colca Canyon. I stedet for å passere det ved å reise til Puno fra Arequipa, bli med denne turen som tar deg til Puno via canyon, kombinere transport med sightseeing. Se vicuñas, alpacas, lamaer, eagles og flamingoer og reise forbi innsjøer, isbreer og vulkaner. The tour was excellent in that it gave us a view of the Peru not too many people get to see. The over night stay at Chivay was thrilling because across the street from our hotel we found an astronomical observatory that let us see the galaxies of the the southern hemisphere and with powerful telescopes we saw Saturn, Mars and Jupiter. This experience was beyond what we expected that truly recommend it. As for the Colca Canyon, we saw 6 or 7 condors flying around moving exceptionally close to us! !